Sally Hansen has always been the leader in all of my favorite nail polishes and other nail products. I've always been impressed by the quality, price, how long they last, and how fast they dry. Over the years I have become more and more interested in gel polish rather than typical nail polish. There are many benefits to gel polish. It can last for up to 2 weeks and you won't get any chips. It leaves a nice durable shiny look on your nails. I have always been a fan of gel polish when I get manicures, and now I am so happy that Sally Hansen offers gel polishes and gel polish starter kits! I received a Gel Polish in Light Pink from Sally Hansen. I was so impressed how quickly it dried with LED Light and it was so easy to apply, just like a regular nail polish except a lot easier. I love love love the light pink color, it looks natural like it's just a beautiful manicure, but it's such a great protective coating over my nails and they have been growing longer without breaking off since this gel polish protects them! 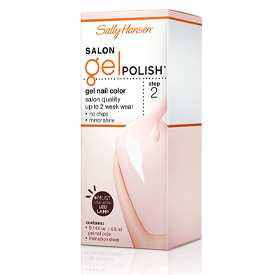 Be sure to pick up your favorite color and try out the gel polish from Sally Hansen for yourself!